The Samsung Galaxy Note, which popularized the phablet form factor. The phablet (/ˈfæblɪt/) is a class of mobile devices combining or straddling the size format of smartphones and tablets. The word itself is a portmanteau of the words phone and tablet. Phablets feature large displays that complement screen-intensive activity such as mobile web browsing and multimedia viewing. They may also include software optimized for an integral self-storing stylus to facilitate sketching, note-taking and annotation. Phablets were originally designed for the Asian market where consumers could not afford both a smartphone and tablet as in North America; phones for that market are known for having "budget-specs-big-battery" with large low resolution screens and midrange processors, although other phablets have flagship specifications. Since then, phablets in North America have also become successful for several reasons: Android 4.0 and subsequent releases of Android were suited to large as well as small screen sizes, while older consumers preferred larger screen sizes on smartphones due to deteriorating eyesight. While Samsung's Galaxy Note (2011) is largely credited with popularizing the phablet when launched in 2011, examples of earlier devices with similar form factors date to 1993. The popularity of phablets grew dramatically in 2012, as a successor to the original Galaxy Note, along with the falling costs and increasing power efficiency of smartphone displays, began to fuel competition in the market from other smartphone manufacturers, including Lenovo, LG, HTC, Huawei, Micromax, and Sony; IHS, Samsung reported that 25.6 million phablets were sold in 2012 alone. Due to the market's growth, Reuters called 2013 the "Year of the Phablet". In 2014, noting that phablets had overtaken laptops and desktops in global sales, The New York Times said "phablets could become the dominant computing device of the future – the most popular kind of phone on the market, and perhaps the only computer many of us need". The Samsung Galaxy Note series, which popularized the phablet form factor. The definition of a phablet has changed in recent years due to the proliferation of larger displays on mainstream smartphones, and smartphones designed with thin bezels and/or curved screens to make them more compact than other devices with similar screen sizes. Thus, a device with a "phablet-sized" screen may not necessarily be considered one. Current phablets typically have a diagonal display measurement between 5.1 inches (130 mm) and 7 inches (180 mm), assuming a 16:9 aspect ratio. In comparison, most flagship smartphones released in 2016 have a screen size of around 5 in (130 mm), with larger versions of mainstream flagships (such as iPhone 7 Plus, Pixel XL, and Samsung Galaxy S7 Edge) using 5.5 in (140 mm) displays. PhoneArena argued that the S7 Edge was not a phablet, as it has a narrow and compact build with a physical footprint more in line with the smaller-screened Nexus 5X, due primarily to its use of a display with curved edges. In 2017, several manufacturers began to release smartphones with displays taller than the conventional 16:9 aspect ratio used by the majority of devices, and diagonal screen sizes often around 6 inches. However, in these cases, the sizes of the devices are more compact than 16:9 aspect ratio devices with equivalent diagonal screen sizes. The Dell Streak received mixed reviews for its large size and dated software despite its pioneering design. The Android-based Dell Streak included a 5-inch (130 mm), 800×480 display and a widescreen-optimized interface. Reviewers encountered issues with its outdated operating system, Android 1.6 (which was not yet optimized for such a large screen size), and the device was commercially unsuccessful. The Samsung Galaxy Note used a 5.3 inches (130 mm) screen. While some media outlets questioned the viability of the device, the Note received positive reception for its stylus functionality, the speed of its 1.5 GHz dual-core processor, and the advantages of its high resolution display. The Galaxy Note was a commercial success; Samsung announced in December 2011 that the Galaxy Note had sold 1 million units in two months. In February 2012, Samsung debuted a Note version with LTE support. By August 2012, the Note had sold 10 million units worldwide. In late 2012, Samsung introduced the Galaxy Note II, featuring a 1.6 GHz quad-core processor, a 5.55 inches (141 mm) screen and the ability to run two applications at once via a split-screen view. The Note II also incorporated a refreshed hardware design based on the Galaxy S III, with a narrower, smoother body. International sales of the Galaxy Note II reached 5 million in two months. The 2012 LG Optimus Vu used a 5-inch (130 mm) display with an unusual 4:3 aspect ratio – in contrast to the 16:9 aspect ratio used by most smartphones. Joining the Galaxy Note II on many carriers' lineups in 2013 was the nearly-identically-sized LG Optimus G Pro, released in April. In late-2012 and early 2013, companies began to release smartphones with 5 inch screens at 1080p resolution, such as the HTC Droid DNA and Samsung Galaxy S4. Despite the screen size approaching those of phablets, HTC's design director Jonah Becker said that the Droid DNA was not a phablet. HTC would release a proper phablet, the HTC One Max – a smartphone with a 5.9 in (150 mm) screen and a design based on its popular HTC One model, in October 2013. Examples of Android phablets with screens larger than 6 inches began appearing in 2013; with the Chinese company Huawei unveiling its 6.1 in (150 mm) Ascend Mate at Consumer Electronics Show, and Samsung introducing the Galaxy Mega, a phablet with a 6.3 in (160 mm) variant, which has midrange specs and lacks a stylus compared to the flagship Galaxy Note series. 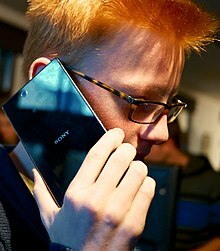 Sony Mobile also entered the phablet market with its 6.4 in (160 mm) Xperia Z Ultra. As a variation of the concept, Asus and Samsung also released otherwise small-sized tablets, the FonePad, Galaxy Note 8.0 and Galaxy Tab 3 8.0, with cellular connectivity and the ability to place voice calls. Later that year, Nokia also introduced Windows Phone 8 phablets, such as the 6-inch Lumia 1520. In September 2014, Apple released its first phablet, the 5.5 in (140 mm)-inch iPhone 6 Plus; the introduction of the new model reversed a previous policy under late Apple CEO Steve Jobs not to produce a mid-sized device larger than the iPhone or smaller than the iPad, which were 3.5 inches and 9.7 inches, respectively, at the time of his death. While Apple's iPad heavily dominated the tablet market, the void in their lineup left an opening for intermediate-sized, with other handset manufacturers already jumping on the trend of producing larger screen sizes to suit all niches. Engadget identified falling screen prices, increasing screen power efficiency and battery life, and the evolving importance of multimedia viewing as critical factors in the popularity of the phablet. Phablets also satisfy a consumer need – for the perfect sized device, since smartphones may be too small for viewing and tablets lose their portability – fuelling their global market growth. Phablets have also been popular with an older demographic of smartphone users – their large screens provide a benefit to those with deteriorating eyesight. In April 2013, Doug Conklyn, vice president of global design for Dockers told Fox News that the company reworked the size of its pants pockets "to accommodate the growing size of smartphones". For women, a small handbag can easily accommodate a phablet, but not most tablets. In January 2013, IHS reported that 25.6 million phablet devices were sold in 2012 and estimated that these figures would grow to 60.4 million in 2013, and 146 million by 2016. Barclays projected sales of phablets rising from 27 million in 2012 to 230 million in 2015. In September 2013 International Data Corporation (IDC) reported that its research indicated that phablets "overtook shipments of both laptops and tablets in Asia in the second quarter of 2013". In 2014, Business Insider predicted phablets would outsell smartphones by 2017. Speaking with CNET in 2014, David Burke, Vice President of Engineering at Google, said "If you gave them a phablet for a week, 50 percent of [consumers] would say they like it and not go back". In Q1 2014, phablets made up 6% of US smartphones sold. In the first quarter of 2015, phablets accounted for 21% of all smartphones sold in the US, with the iPhone 6 Plus making up 44 percent of those phablets sold. ^ a b c d e f g h i j k l m n o p q r s t u v This smartphone has a notch or hole on the screen, which reduces the expected display area (given an aspect ratio and a screen diagonal length) with respect to untrimmed screens. ^ a b Diagonal size of main display, It has a smaller second rear display. ^ a b Segan, Sasha (February 13, 2012). "Enter the Phablet: A History of Phone-Tablet Hybrids". PC Magazine. ^ "Should You Buy a Phablet?". Time. Retrieved 26 March 2016. ^ "Weighing the Phablet's Potential". ^ "Moto G5 Plus review: The new standard for budget phones". 27 March 2017. ^ "Would I Buy A Phablet?". Tech.pinions. ^ Newman, Jared (April 2, 2013). "Phablets Are a Niche, Not a Fad". Time. ^ "'Phablets' and Fonepads the New Tech Lexicon". The Wall Street Journal. April 24, 2013. ^ a b Manjoo, Farhad (September 17, 2014). "With the iPhone 6 Plus, Apple Aims for Versatility". The New York Times. ^ a b "Don't call it a phablet: the 5.5" Samsung Galaxy S7 Edge is narrower than many 5.2" devices". PhoneArena. Retrieved 3 April 2017. ^ a b c d e "We're gonna need Pythagoras' help to compare screen sizes in 2017". The Verge. Retrieved 3 April 2017. ^ "Best phablets of 2016: the 20 best big screen phones you can buy". TechAdvisor. Retrieved 3 February 2016. ^ "8 Best Phablets You Can Buy in 2017". Trusted Reviews. Retrieved 3 April 2017. ^ Segan, Sasha (February 13, 2012). "Enter the Phablet: A History of Phone-Tablet Hybrids". PC Magazine. ^ a b Elgan, Mike (February 18, 2012). "Rise of the 'phablet'". Computerworld. ^ "Will 2013 be the year of the phablet as phone screens grow bigger?". London: Reuters. January 8, 2013. ^ "Dell Streak: A Smartphone With a Tablet Heart". PC World. Retrieved 18 January 2013. ^ "Samsung announces Galaxy Nexus and Note roll-out schedules". GSMArena. 2011-10-27. ^ "Samsung Galaxy Note Android phone". PC World Australia. Retrieved December 4, 2011. ^ Dan Grabham (2011-09-01). "Hands on: Samsung Galaxy Note review". techradar.com. Retrieved 2011-09-27. ^ Mat Smith (December 29, 2011). "1 million Galaxy Notes shipped worldwide, US fans throw money at their screens". Engadget. ^ "Samsung: 10M Galaxy Notes sold in nine months". CNET. Retrieved 18 January 2013. ^ "Samsung Galaxy Note 2 Review (T-Mobile) - The Phablet Returns". Anandtech. Retrieved 24 September 2014. ^ "Multi-window update comes to AT&T Galaxy Note II starting today". Boy Genius Report. Retrieved 18 January 2013. ^ "Samsung Galaxy Note II Tops 5 Million in Sales". PC Magazine. Retrieved 18 January 2013. ^ "LG Optimus G Pro E985". GSMArena. Retrieved August 7, 2013. ^ "Samsung Galaxy S4 review: Supernova". GSMArena. 28 March 2013. Retrieved 14 June 2013. ^ "The Droid DNA: It's Not a Phablet, It's a Smartphone". AllThingsD. Dow Jones & Company. Retrieved 23 September 2014. ^ "HTC One max official with 5.9-inch display and fingerprint scanner". The Verge. Vox Media. Retrieved 14 October 2013. ^ "Samsung Galaxy Mega 6.3 review: Walking tall". ^ a b "Shipments of 'phablets,' or large smartphones, to double in 2013". Los Angeles Times. Archived from the original on 2013-04-16. Retrieved August 19, 2015. ^ Aaron Souppouris (2013-04-11). "Samsung announces Galaxy Mega 5.8 and 6.3, coming to Europe in May". The Verge. Retrieved 2013-07-11. ^ "Sony Xperia Z Ultra review: Is it a tablet? Is it a phone? Really... do you care?". TechRadar. Retrieved 29 September 2014. ^ "ASUS FonePad official: 7-inch tablet with phone functionality, priced at $249 (hands-on)". Engadget. Retrieved 6 November 2013. ^ Smith, Mat (22 October 2013). "Nokia Lumia 1520: Windows Phone with 6-inch 1080p display and 20MP camera for $750". Engadget. Archived from the original on 22 October 2013. Retrieved 26 October 2013. ^ "The Rise of the Ever-Expanding Smartphone Screen" (PDF). Engadget, Distro Issue 79, p. 50, Jon Fingus. Archived from the original (PDF) on 2013-02-28. ^ "Weighing the Phablet's Potential". PC Magazine. Retrieved 5 July 2014. ^ Smith, Edward (January 8, 2013). "CES 2013: Huawei Unveils Ascend Mate and D2 Smartphones". International Business Times. ^ Sophie Curtis (2014-02-06). "My two months with a 'phablet'". Daily Telegraph. Retrieved 2014-09-22. ^ Shaughnessy, Haydn (February 5, 2013). "Will Making An iPhone Phablet Hurt Apple More Than It Will Help?". Forbes. ^ Curtis, Sophie (September 2, 2013). "'Phablets' overtake tablets and laptops in Asia". The Daily Telegraph. London. Retrieved September 4, 2013. Device makers shipped 25.2 million phablets in Asia/Pacific excluding Japan (APEJ) in the second quarter of 2013, compared with 12.6 million tablets, and 12.7 million laptops. ^ "Headache Coming On? Apple's Phablet Could Be Just The Remedy It Needs". Forbes, Mark Rogowsky, June 18, 2014. ^ "Android and Chrome may come together, but don't expect changes yet, Google says". CNET. CBS Interactive. Retrieved 14 January 2015. ^ iPhone 6 Plus leads a surge in US phablet sales. ZDNet. Retrieved 8 May 2015. ^ "Nubia X has a main display with super slim bezels, secondary OLED screen on its back". PhoneDog. 2018-10-31. Retrieved 2018-11-01. ^ "ZTE nubia X unveiled with two screens and two fingerprint readers". GSMArena.com. Retrieved 2018-11-01.